The market was hit with a major selloff on Monday as a host of concerns rattled investors. The S&P 500 in particular fell below a key technical level. Investor sentiment around the S&P 500 took a beating on Monday, and the selling may not be over so quickly. The Dow Jones Industrial Average fell 335 points, or 1.4%, to 24,610, the S&P 500 declined 1.53% and the Nasdaq Composite was down 1.9% as Facebook (FB - Get Report) shares tumbled nearly 7%. The tech sector was falling the most following Facebook's selloff related to the Cambridge Analytica scandal. Facebook is a holding in Jim Cramer's Action Alerts Plus. But it's the S&P 500, which had fought back nicely from the February correction lows, that should have investors most uneasy. With an open below the key 2,751 level on Monday, the S&P 500's rally off last month's lows could be viewed as a false positive. Hence, more selling may in store, suggests technical analysts at Bank of America Merrill Lynch. 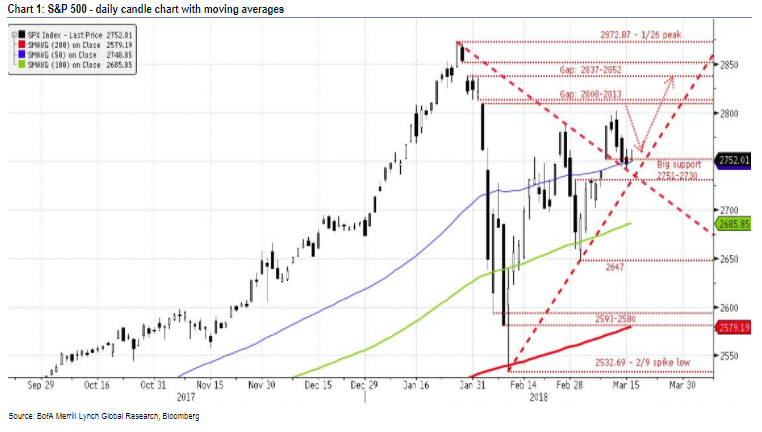 "Constructive indicators suggest more upside but the S&P 500 must hold a confluence of tactical support at 2751-2730 to confirm a bullish breakout/retest pattern," writes Bank of America Merrill Lynch technical analyst Stephen Suttmeier. "Should the S&P 500 weaken and break 2751-2730 support, the next major support is 2686 (100-day MA) and 2647 (3/2 higher low)." Cautions Suttmeier, "If the S&P 500 does not respond to the bullish indicator weight of evidence and cannot surpass last week's 2801.90 high, then we cannot rule out a measured move correction toward 2465-2460."